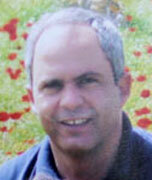 Aug 18, 2011 - Moshe Gez, 53, of Kfar Sava was one of eight victims of a series of terrorist attacks perpetrated against civilians and IDF soldiers in Israel''s southern region. Moshe Gez was on his way to a vacation in Eilat along with his wife Flora and her sister and brother-in-law Shulamit and Dov Karlinsky. All four were killed when terrorists opened fire on their vehicle on Route 12 near the border with Egypt. Moshe had a home renovation business. His eldest daughter Vicki eulogized her father: "I will always remember your smile and your warm-heartedness. Your relationship with Mom was a model for me." Moshe Gez was buried in Kfar Sava. He is survived by three children.